Stoby, who ran 10:38.1 in last month’s series opener just missed Reynold Brown’s course record of 10 minutes, 28.1 seconds from 2003, settling for in a time of 10:31.65, capturing another victory and remained the 2016 undefeated runner on both Virgin Gorda and Tortola. In becoming the second best performer in the history of the series on Virgin Gorda, he was followed by Julius Farley who ran 11:40.08 and Emrol Amsterdam who ran 12:29.99 respectively. Saungie Liburd’s, 13:51.56 and Rosmond Johnson’s 14:13.83 were more than good enough for first and second respectively overall for the women. Sean Samuel of Robinson O’Neal Memorial Primary running 17:06.25, had a strong showing in the Primary division, but the team effort of Ciboney School led by Eva Fox keeps them as the leader of that category. In the Secondary category, Bregado Flax’s, Harrigan House captured the win for race two followed by O’Neal House and Rhymer House in second and third respectively. This division continues to be strongly supported by athletes from Raw Skillz Track club. Races return to Paraquita Bay on Saturday, for race three of the Tortola leg. Participants are encouraged to again wear pink as they partner with the BVI Cancer Society and continue to bring awareness to breast cancer. Race registration will be at 6:30 a.m. at the College’s Paraquita Bay campus, ahead of the 7 a.m. start. Final Results: Two Miles: Open Men: 1. Reuben Stoby, 10:31.65. 2. Julius Farley, 11:40.08. 3. Emrol Amsterdam, 12:29.99. 4. Curwin Andrews, 13:13.45. 5. Clinton Simmons, 13:33.38. 6. Claudius Rymer, 13:55.06. 7. Keanu George, 14:09.71. 8. Lindsay Pereira, 18:43.70. 9. Mark Moore, 25:49.26. 10. Jhomar Smiths, 30:02.35. 11. Roy-Carl Williams, 38:00.64. Women: 1. Saungie Liburd, 13:51.56. 2. Rosmond Johnson, 14:13.83. 3. Eonthra Sampson, 21:06.96. 4. Ciel Fox, 25:50.04. 5. Shernette Gayle, 30:01.35. 6. Christina Yates, 32:07.05. 7. Lori-Jean Stevens, 32:08.65. 8. Jennifer O’Neal, 32:46.31. 9. Pansy Walters, 32:47.45. 10. Shanique Creque, 32:48.67. 11. Jennifer Darroux, 32:53.47. 12. 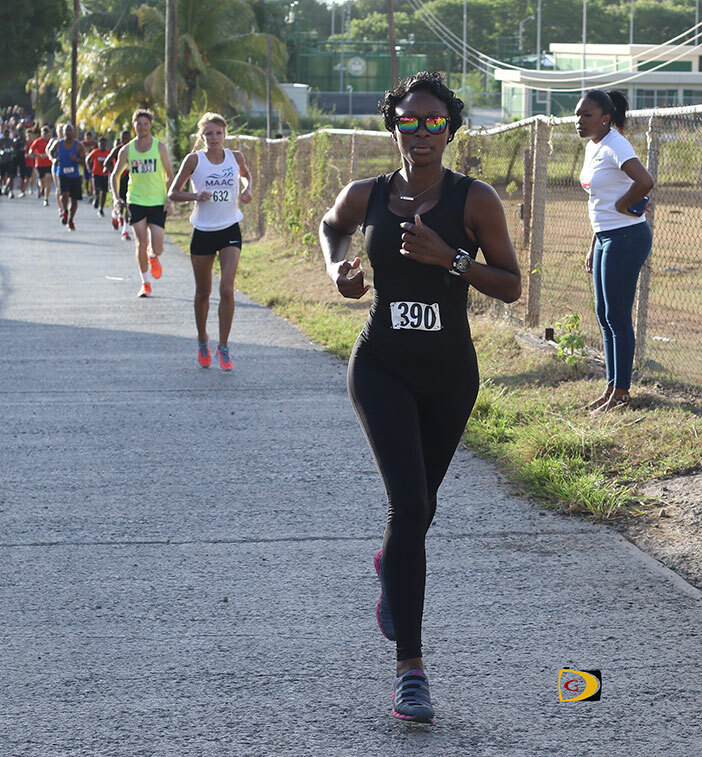 Gloria Fahie George, 33:49.10. 13. Casey McNutt, 34:19.89. 14. Vanessa Rymer, 34:25.48. 15. Laura Fox, 34:29.31. 16. Sarah Moore, 34:31.11. 17. Joy Defreitas, 38:02.79.